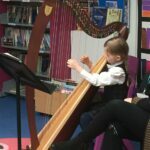 A mellow and relaxing atmosphere spread across the Junior School on the afternoon of Tuesday 20th March courtesy of our budding harpists who performed a tranquil recital in the Junior School Library for their parents and carers. 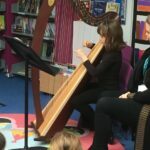 Learning the harp is a challenging but rewarding pursuit. 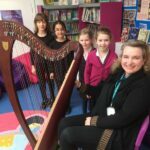 Anyone interested in taking up the instrument should contact Miss Duval for more information. 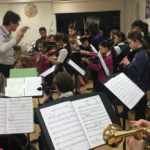 Every Thursday lunchtime a cross-section of Junior School girls come together to learn and rehearse a variety of orchestral pieces together. In assembly on Thursday morning we were give the opportunity to hear their repertoire in action. 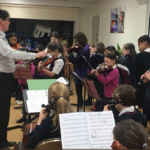 Next term we look forward to seeing the Junior School Orchestra perform at the Garden Party and Prize Giving. 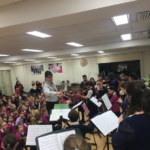 Thank you to Mr Harper, Miss Bruce-Mitford, Miss Duval and Mr Welch for supporting the orchestra so generously.